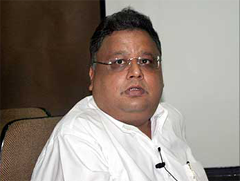 Rakesh Jhunjhunwala is known as Stock Market King of India. Many investors follow him, especially when it comes for stock selection. This time even stock selected by rakesh jhunjhunwala could not be saved in recent mid cap crash. Many small investors, who fashioned their portfolios after that of Rakesh Jhunjhunwala, discovered this painful lesson with the recent mid-cap crash eroding his portfolio value by Rs 1,000 crore. Majority of Stocks owned by Jhunjhunwala including Bilcare, A2Z Maintenance, DB Realty, Autoline Industries, Hindustan Oil Exploration and Delta Corp has underperform and given negative returns in last 3 months. Many small investors who has taken decision to purchase these stock just because it is part of Rakesh Jhunjhunwala’s portfolio has to just wait and watch till these stocks perform again. Out of this 2 core stocks Titan Industries and CRISIL has end up giving negligible or negative returns. Titan Industries was available at 233 Rs/- in March 2012 and right now it is quoting 245 Rs/-. Similarly CRISIL was available at 950 Rs/- in March 2012 and right now it is quoting 905 Rs/-. This two core stock from Rakesh portfolio has given less/negative returns. Rakesh Jhunjhunwala has lost almost 750 Cr in these stocks only. Rakesh Jhunjhunwala’s believe in strategy to ‘Buy Right Hold Tight’. But this time holding these stocks has not given any advantage to him or to other investors. The overall sentiment, especially in the midcap segment, has affected stocks owned by Rakesh. A slowdown in business, pledging by promoters, over-leveraging, failure to service debt and ratings downgrades were the prime reasons for the recent carnage in midcap stocks, and Rakesh’s portfolio was no exception. Lesson Learned: – No one can predict up and down in market including Rakesh Jhunjhunwala. Better opt for stop loss option to minimize risk/loss. Remember “Trend is Best Friend”. If you find valued stock available in low price you should grab opportunity to buy especially in market crash. As I am beginner and searching for investment options these articles are very helpful to choose the right candidate.